Careers Cost > How Much Does a Little Caesars Franchise Cost? How Much Does a Little Caesars Franchise Cost? Noted as the fastest growing pizza chain from 2008 to 2015 based on the net number of stores added, Little Caesars, an international brand and household name, has come a long way since it opened its very first store in Detroit, Michigan, in 1959, with the first franchise opening in 1962. Today, Little Caesars, according to its official website, is currently seeking franchisees who are looking to help bring the famous HOT-N-READY® pizza brand nationwide. 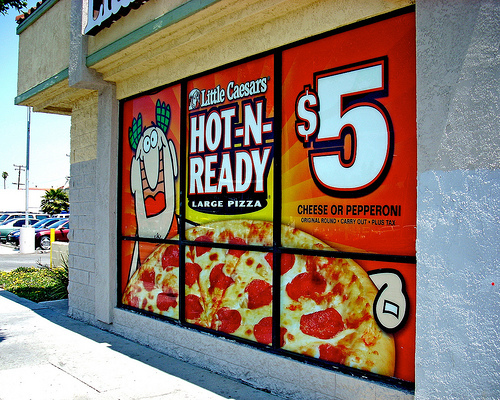 The costs of a Little Caesars franchise, as there are so many variables, can greatly vary. From our research, the costs, when all of the initial investment is considered, can range from $275,000 to more than $1 million. Little Caesars asks, at a minimum, that you need to have a minimum of $100,000 in liquid assets and a net worth greater than $250,000 to secure financing to open your new location. The official website notes the average carryout location can range from $334,000 to $1,370,500, with the higher-range stores typically in a free-standing building, not a strip mall. The cost of a franchise can greatly vary, but CNN Money notes the startup costs are between $193,050 to $619,500 and a new owner, at a minimum, should have a net worth of at least $150,000 and $50,000 cash, with any remaining funds being able to be financed. In its 10 great franchise bets, CNN noted that out of 103 SBA-backed loans, only one loan failed. Franchise Direct, on the other hand, states, the estimated total can range anywhere from $334,000 on the low end to as high as $1.3 million on the high end. You will be asked to submit an application along with the supporting documents. After the documents are received, corporate will review your application. If you do meet the qualification, you will then be sent a Franchise Disclosure Document, which will assist you with the due diligence process and help make a decision if purchasing a franchise makes sense. After you sign the Franchise Disclosure Document, a licensed adviser will then contact you and schedule a “Discovery Day” and interview. After your interview completes, you will then be notified later on if you were approved to become a franchisee. Once you’re approved, you will submit your deposit, attending a real estate training class and choose a site for your future store. After you pick out a location, you will then attend a six-week in-store operations training program, where you will learn the process of successfully running a store. Upon completion of training and constructing your new location, you can successfully start to run your store. From start to finish, the entire process can take 100 to 365 days. Is the $5 HOT-N-READY® pizza profitable for franchisees? According to Smart Money, the franchisees, when factoring in labor, food, rent and utilities, many reported making close to $0.90 for every $5 pizza sold. According to one franchise operator, the ingredients and packaging retail for about $3.50 and this doesn’t include the rent, labor or utilities, which can another $0.60 to every pizza sold. A spokeswoman for the company says the figures can greatly vary from one franchise owner to the next.